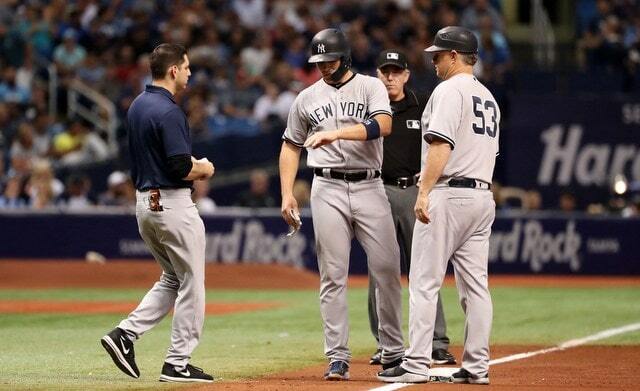 9:07pm ET: X-rays on Drury’s hand are negative, the Yankees say. Exhale. Drury has a bruise and that’s it. I imagine he is considered day-to-day. 8:41pm ET: The seemingly never-ending string of injuries continues. Brandon Drury exited tonight’s game after taking a pitch to the top of the left hand in the fifth inning. He stayed in to run the bases briefly before being removed. His hand looked pretty swollen as he walked off the field. Surely he’s heading for x-rays. Losing Drury for any length of time would hurt for two reasons. One, it’s one fewer healthy player, which saps the team’s depth. Gleyber Torres is due to come off the disabled list tomorrow, but still. And two, Drury’s name has popped up in multiple trade rumors this year. An injury could take him off the table as a trade chip. The Yankees have not yet announced an update on Drury but x-rays tend to get turned around pretty quickly, so we should here something soon. Hopefully there’s no fracture and it’s just a bruise.